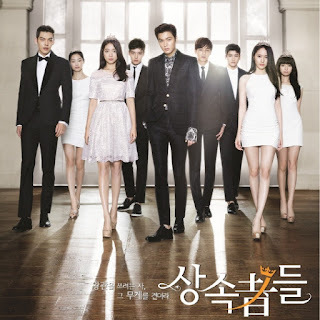 The Heirs (왕관을 쓰려는 자, 그 무게를 견뎌라 – 상속자들), also known as The Inheritors, is a South Korean television series starring Lee Min-ho, Park Shin-hye and Kim Woo-bin. Written by Kim Eun-sook, the trendy drama is set in a high school populated by the privileged and uber-rich. It aired on SBS from October 9 to December 12, 2013 on Wednesdays and Thursdays at 22:00 for 20 episodes. This was the first Korean drama co-produced by American digital distribution platform DramaFever and Korean production company Hwa & Dam Pictures. The series was a major hit in South Korea and received immense popularity across Asia.